Special Counsel Robert Mueller is closing on Donald Trump’s son-in-law and senior advisor Jared Kushner in the Trump-Russia investigation, looking at Kushner’s attempts to secure financing for his company from foreign investors in late 2016. “People familiar with the inquiry” said Mueller is reviewing Kushner’s discussions that include a meeting in early December with Serkey Gorkov, the head of the Russian State bank Vnesheconombank. Kushner testified to a Congressional committee that the meeting was for official US government purposes. But Vnesheconombank said the encounter in New York was a business discussion involving Kushner Companies. Kushner was pursuing finance for a troubled New York City office building project. Kushner Companies is facing a $1.4 billion mortgage payment in early 2019 on the property. Kushner also met the chairman and other executives of Anbang Insurance, the Chinese conglomerate that owns the Waldorf Astoria hotel in New York. The Anbang chairman said a deal was close, but talks collapsed in March. Kushner’s dealings with a Qatari investor stalled when the Chinese withdrew. In early 2017, Kushner reportedly divested his interest in the building on 666 Fifth Avenue, purchased by the Kushner Companies in 2007 for $1.8 billion. A spokesperson said the stake was sold to a family trust from which Kushner does not benefit. The advisor is already under scrutiny over matters such as the Trump campaign’s 2016 data analytics operation, his relationship with former National Security Advisor Michael Flynn, and contacts with Russian officials. Flynn pleaded guilty in October on a charge of lying to the FBI over his conversations in December 2016 with Russian Ambassador Sergei Kislyak, including assurances that a Trump Administration would limit sanctions imposed by Barack Obama on Moscow over Russia’s interference in the 2016 election. 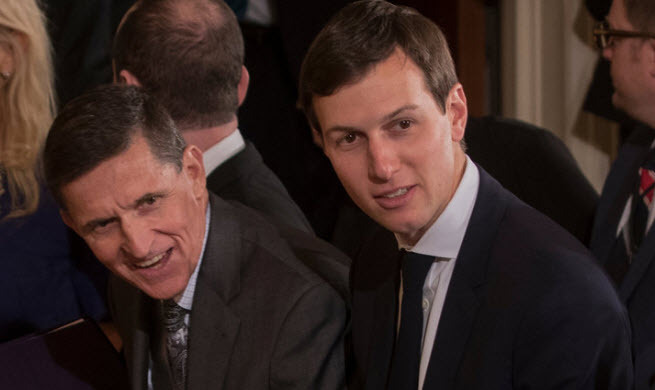 Court records said Kushner had given guidance to Flynn before he spoke with Kislyak over a UN Security Council resolution about Israel and Palestine. Another anonymous source with questionable motives now contradicts the facts — in all of Mr. Kushner’s extensive cooperation with all inquiries, there has not been a single question asked nor document sought on the 666 building or Kushner Co. deals. Nor would there be any reason to question these regular business transactions.